Ball pythons are one of the most popular snakes kept in captivity worldwide. Keeping them can be very rewarding and on the whole, is not too difficult. Ball pythons are known to be shy animals and (like other snakes) will seek comfort in a small and dark space. Adults will need a 30 gallon tank. Younger snakes can be kept in 10–20 gallons. Make sure you have a securely fitted top to the tank. All snakes are notorious escape artists, and you don't want to have to visit the 'how to find your lost snake' articles. As ball pythons are cold blooded, they rely on external heat that you as the owner will provide for them. The snake itself will modulate its own heat requirements and will therefore need a healthy range of temperatures throughout the enclosure. The warm side of the enclosure should be between 87 - 90 F and the cool side should be 77 - 80 F. An easy way to adjust humidity levels in your enclosure is by increasing/decreasing the size of the water bowl. Conversely, you can increase/decrease the amount of ventilation the enclosure receives. Daily misting is not be necessary for a ball python. 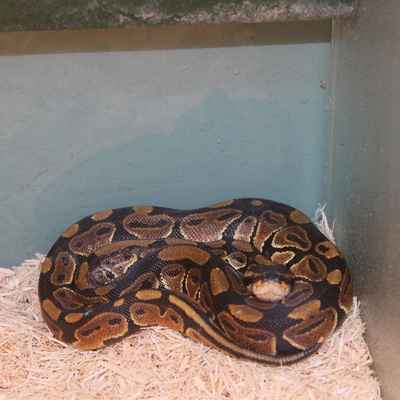 Ball pythons are clean animals and almost any type of substrate you find in the pet shop will work just fine. The more porous the substrate the more it will retain moisture and bolster the humidity. The most popular bedding is probably aspen shavings. Aspen is easy to spot clean and easy to replace entirely. Remember that cedar is not a suitable bedding as it is toxic to all snakes. Ball pythons seek dark and secure places to spend most of their time and providing the right amount of hides is critical to the snakes sense of security. If the snake does not feel secure, it will stress and give you feeding problems. Provide a hide on both the warm side and the cool side of the enclosure. If your enclosure is quite large, then providing more hides will be necessary. Make sure there is always fresh water in the enclosure of your ball python. Allow your snake to acclimate to its new home for a couple of weeks. Start your hatchling (about 15" in length) off with a single pre-killed one week to 10-day old "fuzzy" mouse. A smaller sized hatchling may require a smaller mouse; try a pre-killed 5-day old. Older ball pythons may be fed larger pre-killed mice or pinkie rats. After giving your ball a couple of days to settle in, begin picking it up and handling it gently. It may move away from you, and may threaten you by lashing it's tail and hissing; don't be put off - it is usually just a bluff, and snakes, like most reptiles, are very good at bluffing! Be gentle but persistent. Daily contact with each other will begin to establish a level of trust and confidence between you and your snake. When it is comfortable with you, you can begin taking it around the house. Don't get overconfident! Given a chance and close proximity to seat cushions, your ball will make a run (well, a slither) for it, easing down between the cushions and from there, to points possibly unknown. Always be gentle, and try to avoid sudden movements. If the snake wraps around your arm or neck, you can unwind it by gently grasping it's tail and gently unwrapping it from around your neck or arm - do not try to unwrap it by moving the head. Some snakes are a bit sensitive about being handled soon after they have eaten. If you feed your snake out of it's enclosure, go ahead and replace it back into it's enclosure after it has finished eating. Then leave it be for a couple of days. As the snake gets more comfortable with you, it will be less nervous and less likely to give you back your mouse.